I told him when we split that I can't be "just his friend." He was keen on telling me that, "We'd always be friends." He insisted, "I'll always look out for you." I know that I don't want to see him in that light EVER. I don't want to be "just his friend." It feels like a horrible torturing technique and I don't want any parts of it. I can be civil but I don't want friendship. Just last night, I wrote in my journal that I don't really think of him and that I don't see how we made it work for thirteen years. I believe that he wanted a submissive woman, a stay-at-home housewife. He wanted to make all the decisions and for the woman (me) to follow. I think I was like that for everything except for where we lived. I just wanted to be in Hawai'i. Oddly enough, as soon as we split, I moved away from Hawai'i within the year. I don't know what kind of sense that makes but here I am in South Carolina and I am loving EVERY.SINGLE.MINUTE of my time here. A good portion of why I left is because he was/is still there. The thought of running into him with another woman was way too much for me to consider. A friend of mine had already run into him with someone else and it shut me down for a couple days. My heart just cannot deal with that right now or maybe ever. Parts of me wish for it back and then I remember the not-so-good things and realize that I am good. I am making my way in the world and I can do this. The freedom at which I move about the world makes me so very happy. So I have a few bad days when I wish for my old life but for the most part, I am doing oh-so-fine and feeling great. The sadness that was me for most of 2016 and 2017 is way out the door. 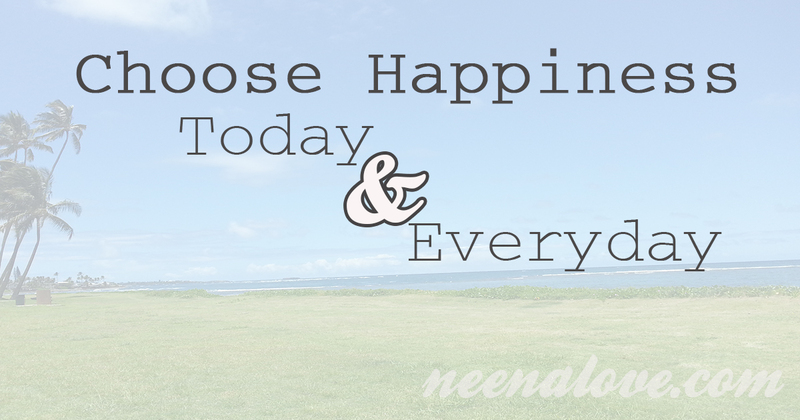 I am choosing happiness today and everyday. YeahYouuu! !